I don’t think I’ve ever mentioned it but I belong to an online community called Chowhounds. Perhaps you’ve heard of it. Or even belong yourself. Chowhounds live all over the world and get together in forums categorized by either location or interest. You can sign up to get emails about trending discussions with articles from Chowhound writers about a myriad of food related topics or you can go directly to the forums to interact. And it's all free! I’ve received (and given) advice about ingredients and restaurants and cooking methods over the last couple of years, but my favorite part of Chowhound is finding out about new ingredients. Last spring, just before I was headed to Providence to spend Spring Break with my daughters, I read about bacon salt in a Chowhound email. It wasn't so new, just new to me! All natural, smoky bacon flavored salt that is vegetarian. I was so excited! Because, as you have read here, both daughters (and many of their friends) are vegetarian. When I cook for them, I miss the addition of bacon for depth and flavor. Especially in dishes with beans. Here, finally, was my answer! 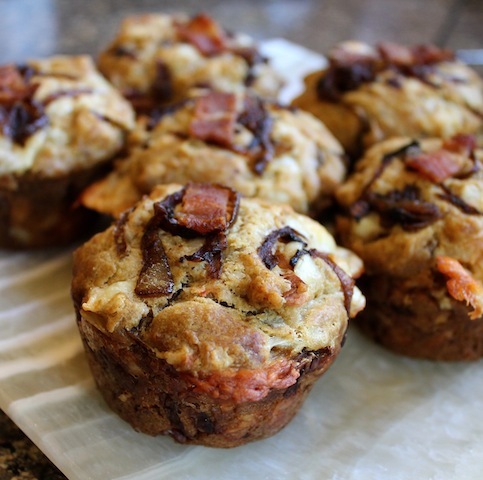 This week’s Muffin Monday recipe was for a cheese onion muffin and I really wanted to add in bacon, but I have been sending these off to the office with my husband (apparently Sundays are their favorite day now) and several of his colleagues don’t eat pork. Bacon salt to the rescue! I made the batter with the bacon salt and then added the optional bacon into the batter once some of the muffin cups had been filled. So, everyone could have a muffin! Grate your sharp cheddar cheese and cut the smoked cheese into cubes. Fry your bacon in a skillet and drain on some paper towels. Chop it into little pieces and set aside. Slice the onions thinly and pop them in the bacon pan with a small drizzle of olive oil. (You can leave some of the bacon grease if dietary restrictions allow but I washed the pan out and used just olive oil.) Cook over a slow to medium fire, stirring frequently, until the onions are lovely and golden and caramelized. Do be careful not to burn them. Once they are done, take the pan off the heat and allow the onions to cool. In a large mixing bowl, whisk together your flour, salt, smoked paprika, baking powder and baking soda. Add in the grated cheddar and give the whole thing a good stir. Whisk the oil, egg and buttermilk in a smaller bowl and add in about two-thirds of the cooled onions. Stir well. Pour your wet ingredients into your dry ones and stir a couple of times. Add in the smoked cheese cubes and fold to combine. If all of your muffins will have bacon, fold the chopped bits in as well, reserving 12-16 small pieces to add to the tops before baking. If you are making some vegetarian (and halal) muffins, spoon some of the batter into the prepared muffin cups before adding the bacon. Thanks to the flavored salt, smoked cheese and smoked paprika, these are cheesy and smoky and delicious, with or without the bacon! The deliciousness of the crunchy outside is only rivaled by the cheesiness of the wonderful inside. These look so wonderful! I'm going to make them for Saturday mornings because they are always so rushed with flea market/yard sales calling! They'd make the perfect breakfast or mid-morning snack. Or lunch. Can you tell I loved these muffins? One day I am going to come to OK and go yard sale-ing/flea marketing with you, Kelli! One of my favorite things to do! These immediately made my mouth water! I am a huge caramelized onion fan and the fact that you then added the smoked cheese and bacon makes these pure perfection. I need to make these! These muffins are amazing!! But i have a problem, I don´t see how many eggs do you put in. Is it written and I don´t see it or there is a mistake? Rats! Thank you so much for pointing out my omission, Lara! I have corrected the ingredients list. One large egg!